In order to make up from my previous "cranky" post, I wanted to let you in on this beautiful website entitled Snowcrystals.com . It's hosted by Kenneth Libbrecht, a professor at CalTech who has taken the most beautiful pictures of snowflakes. In addition to the photographs, Professor Libbrecht provides scientific analysis of snowflakes and answers questions such as, "Why is snow white?" 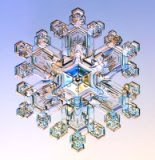 All in all, pondering the beauty and uniqueness of each snowflake, makes one think of the love and devotion of the Creator who molded each of us individually. How much does he care for us, when he has taken the time to make beautiful snowflakes that can disappear in seconds. 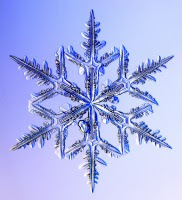 And, yes, professor Libbrecht answers the question, "Are no two snowflakes alike?" You'll have to check in with him for the answer.